“To boost the pomegranate production it is important to follow proper irrigation schedule and grow it along with papaya as the later safeguards the plants from the diseases and pest attack,” shares Mr. Sharanabasava C Hiremath. He hails from Lingasugur village, Raichur district, Karnataka. His farm spreads in 16 acre having papaya and pomegranate both in 6 acre. Plantation was started in 2013. 2500 saplings of pomegranate are transplanted in 6 acre keeping 7 feet distance from row to row and plant to plant 14feet. “I have planted the saplings in zig-zag manner, cross distance is 10 feet and diagonally 14 feet. Zig-zag method is opted because sunlight and air are uniformly obtained by all plants. In the same area, 2500 saplings of papaya are also grown,” he shares. Red lady papaya and Kesar pomegranate variety are grown in the orchard. 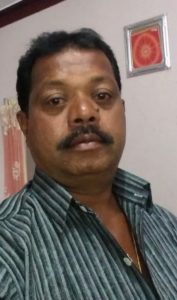 Initially Mr. Sharanabasava planned for banana cultivation but choose pomegranate as the main crop because it suits the climatic conditions of his farms’ location. “The temperature goes upto 42 degrees and it is optimum temperature for pomegranate. Besides, in our region we do not have walk-in customers for banana where as we receive many bulk buyers (traders) for pomegranate hence selling is easy,” he informs. Papaya was chosen as second crop as it complements pomegranate very well and restricts the attack of virus in the orchard. “It is difficult to maintain pomegranate as mono crop because of various virus attacks. 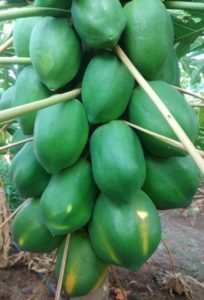 Papaya yields till 5months then the plants are replaced. By this time, pomegranate plants attain 4 feet height and we prune it to escalate the growth of the plant. Next we remove the papaya trees, thus for subsequent 6-8months pomegranate plants get good sunlight and grows well,” he explains. Mr. Sharanabasava prefers chemical based farming over organic as he grows as per the market demand and trend. “The reason being, in organic farming the fruit size is very small and lacks the shine that attracts the buyers! Further as I do not have desi cows in my farm, buying vermicompost, cow dung and urine costs more than the chemical inputs. Therefore in my farm I have taken a central approach of using equal quantities of chemical and organic input,” he opines. Production of both the fruits in the orchard is good as scheduled program of fertilizer input, irrigation, pruning etc is done at the farm. Kesar pomegranate has good demand in market. “The first pomegranate harvest was sent to Sri Lanka and second to Tamil Nadu, Coimbatore, Delhi and Mumbai. 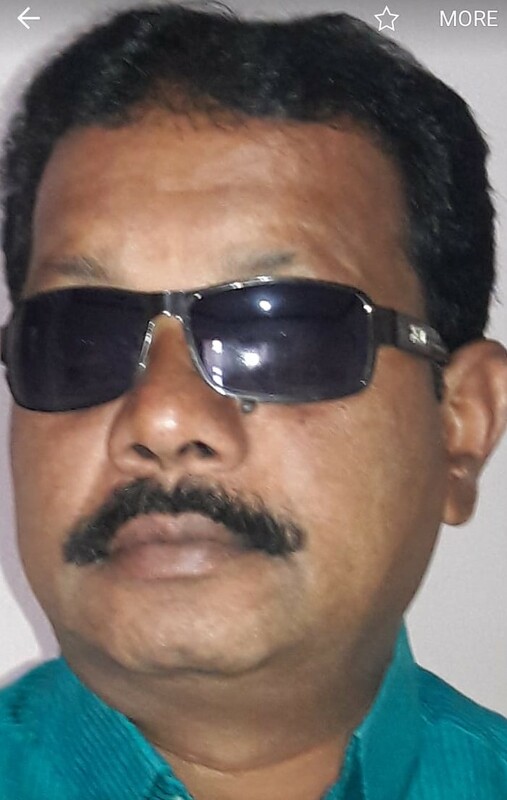 I get buyers from these places at my farm to make the purchase,” he informs. Pomegranate sale fetches income of approximately Rs. 35-40 lakh annually. Pomegranates are graded from 150 – 950 gram. “We fix one flat price for pomegranate after checking the rates in Mumbai market. We quote Rs. 10 less than the Mumbai market and transportation has to be buyer’s responsibility. We put only one condition that buyer has to take the fruits of mix grades right from 150 gram to 950 gram,” he highlights. Grades are SSSS – 700-950 gram, SSS weighs 500-700 gram, SS weighs 450-500 gram, S weighs 350 -450 gram, SPL weighs 250-350 gram, A1 weighs 200-250 gram and A2 weighs 150 -200 gram. On an average 200 ton is the papaya production in the orchard. It is sold to the traders from Kolkata, Punjab, Madhya Pradesh, Rajasthan, Mumbai and Bangalore. Mr. Sharanabasava’s future plan is to expand pomegranate cultivation to another 4 acre. “Farming is profitable only when done diligently. All farmers do not commit suicide or are forever in debts. Take up agriculture willingly accepting all the challenges and believe in yourself instead of listening to the advices/suggestions/opinions on farming from non-farmers!” he signs out.